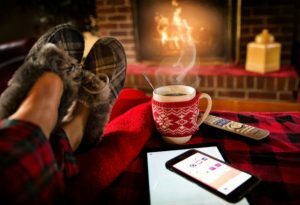 Home » Science Notes Posts » How Stuff Works » Why Do You See Your Breath When It’s Cold? When it’s cold outside, you can see your breath because water vapor condenses into fog. If you’re outside on a cold winter day or even if you breathe into the freezer, sometimes you can see your breath. Yet, sometimes it’s not all that chilly and see you puffs of vapor, while other times it’s downright frigid and you don’t see anything at all. What’s going on? Exhaled air contains a lot of water. When you breathe into cold air, the water vapor condenses to form tiny water droplets and ice particles. Basically you look like a fire-breathing dragon because the outside air can’t absorb the extra humidity. You can feel there is a lot of water in exhaled air if you breathe into your hand a few times. The surface of your skin will get slick with moisture. When it’s cold outside, air can’t hold very much moisture. This is why 100% humidity in the winter feels dry, yet 100% humidity in the summer feels like you’re practically soaking in water. 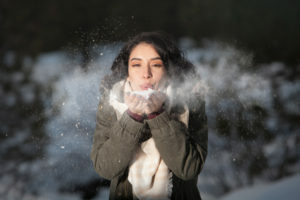 When you exhale into saturated cold air, the extra water from your lungs can’t be absorbed by the surrounding air, so it condenses into tiny water droplets or ice particles (depending on the temperature), forming a cloud you can see. Even if it’s cold, if the air is dry, you may not be able to see your breath. You may be able to predict whether or not you can see a cloud of vapor based on the relative humidity. If it’s low, you can huff and puff with no visible results. Warm air can hold a lot more water vapor than cold air. Usually, you don’t see your breath when it’s warm. You almost never see it indoors because most buildings maintain humidity at a relatively low level. However, if you go outside when it’s hot and the air is saturated with water, you may be able to see your breath. A good time to test this is after it rains in the summer. An early summer morning (when there is dew on the ground) is another good time to try. When you see your breath, you’re seeing condensed water. Is it possible to see other gases? In Antarctica, temperatures sometimes plummet below the freezing point of carbon dioxide, which is –78.5 C (-109.3 F) at 1 atmosphere of pressure (sea level). Yet, scientists don’t find dry ice (solid carbon dioxide) snow. The reason is that its partial pressure is too low, so when carbon dioxide freezes out of air it immediately sublimates back into gas. The other issue is that most of Antarctica isn’t at sea level. It’s much higher, which means the atmospheric pressure is lower than at sea level. At a reduced pressure, the gas phase of the molecule is favored. Even at a low pressure, condensation of dry ice is possible. For example, dry ice snow is seen on Mars. Although the planet’s atmospheric pressure is much lower, carbon dioxide is the most abundant gas. The reason you only see dry ice snow on Mars at the poles is because the temperature has to be super-cold to favor the solid over the gas at such a low pressure. Perhaps if you exhaled at a Martian pole in winter (a super bad idea), you could see both water and carbon dioxide condensation. A hot beverage can form a cloud of water vapor, too. If you want to see your breath, there are two easy ways to do it that don’t depend on the weather. Breathe on a glass mirror or window. The surface of the glass is colder than the hot air from your breath, so water condenses into a visible mist. Breathe into a home freezer. Typically, the interior of the freezer it at its maximum humidity. If you add water from your breath, you’ll make an artificial cloud. You may also see condensation when you pour a cup of hot tea, coffee, or cocoa. This cloud of vapor forms even in front of a toasty fire.